The first phase for the finishing process is sanding. We use high-tech dustless sanding machine systems to minimize dust contamination and eliminate health risks associated with it. We also use the traditional hand scrapping method to achieve an antique look for the floors. Sanding phase is followed by coloring which is done through deep-acid etching or traditional staining. Lastly, the whole process is completed by applying the finest burnishing oils, natural waxes and/or environmentally-friendly natural oils. 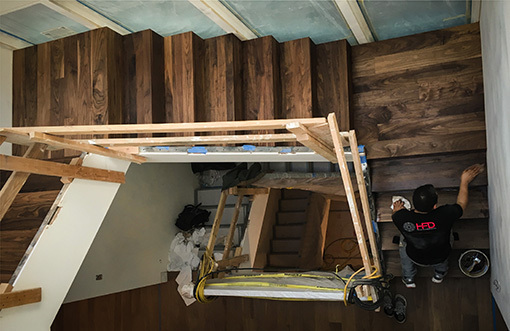 One thing that differentiates us from most of our competitors is our ability to complete all the above mentioned steps in our shop and install the finished material at the client’s site. 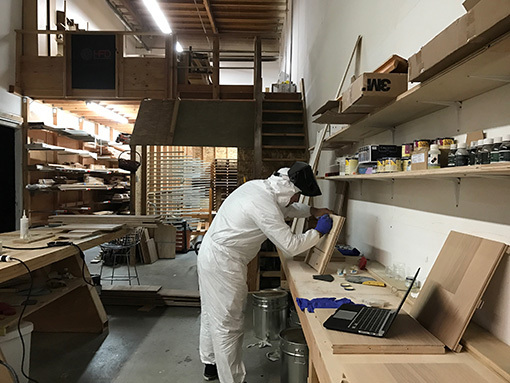 Adjacent to the shop is our gallery like showroom where in addition to a wide range of pre-finished wood floors, we display our own custom colors and finishes. We welcome everyone to our showroom to gain a better idea of what we offer.